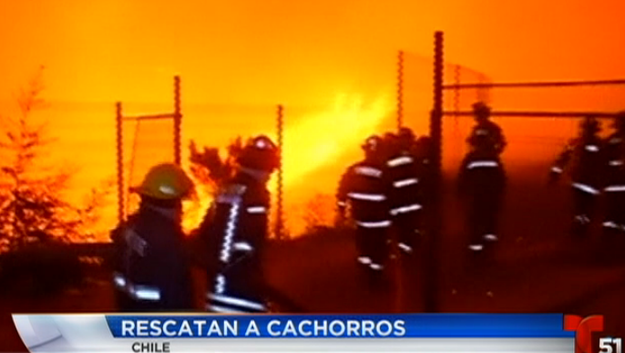 Telemundo, a Chilean television station, has an amazing story that came out of a forest fire near the city of Valparaíso. It reported that witnesses had seen a dog leading her puppies away from the fire and towards a metal container. And the station has footage of rescuers subsequently retrieving the puppies from the hole! Fortunately the mother survived too. She wasn’t in the hole, but the station reported she managed to find shelter from the flames. According to the Daily Mail, residents have now come forward to adopt the puppies and their mother, who’s been nicknamed “Blackie”. The BBC reported that more than 500 hectares have been burned by the fire, which started last Friday.